Bombay Beach at the Salton Sea, Bashford’s Hot Mineral Spa, and the town of Niland, CA, home of Salvation Mountain and Slab City. 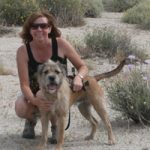 It was the second time I had made the journey from Indio, CA to the small town of Niland, CA, located near the southern end of the Salton Sea. My friend Sue was interested in photographing the graffiti at Slab City, a free camping area that is a winter home to snowbirds and a handful of year-round residents. Without stops along the way, the drive would probably have taken about an hour each way. There are, however, some interesting places to explore along Highway 111, so give yourself some extra time to check out a few points of interest along the way. We left Indio, CA around 7:30 am on a sunny Thursday morning, making our way to Hwy 111 to begin our drive south. The highway runs along the east side of the Salton Sea. We didn’t go into any of the designated Salton Sea Park areas, as we wanted to explore abandoned seaside buildings at Bombay Beach. 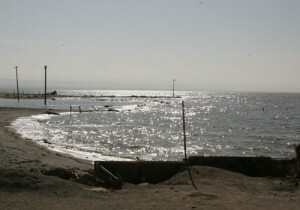 The sparkling Salton Sea. 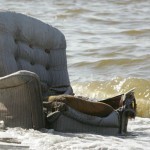 Photo taken at Bombay Beach. 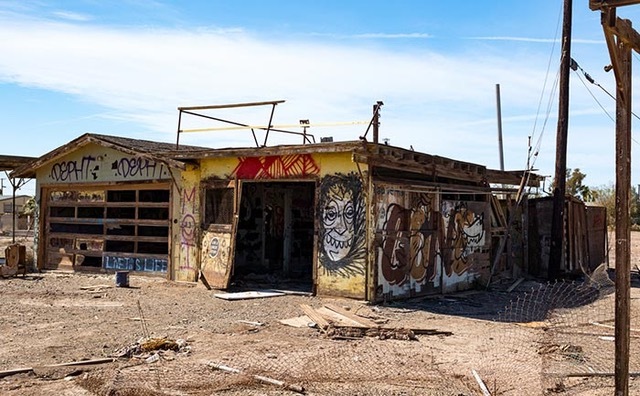 Bombay Beach, CA is a point of interest for photographers and visitors who want to view and shoot the ruins of the town that once was. 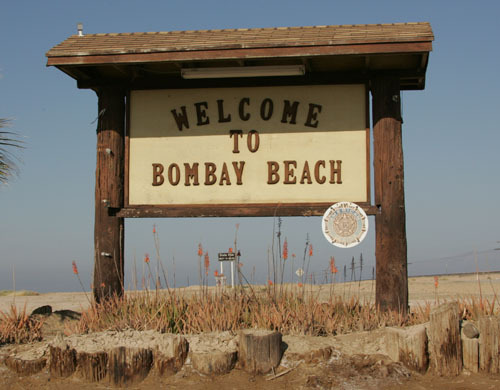 The altitude at Bombay Beach is one of the lowest in North America, which contributed to the deleterious effects of the rising and falling water levels of the Salton Sea. Many of the old buildings, boats and homes were half buried in mud or ruined by water damage. The town still has about 366 residents (according to the 2000 census) who live in trailers and small houses set back from the sea, with a berm protecting them from the fluctuating water levels. The small seaside community is a quiet place where the residents keep to themselves; tourists feel like they are driving through a ghost town. We drove in a big loop through the neighborhood before stopping and parking our car at a ramp that led us over the berm, to sparkling views of the sea. A short walk to the shoreline took us past some of the ruins buried in mud. 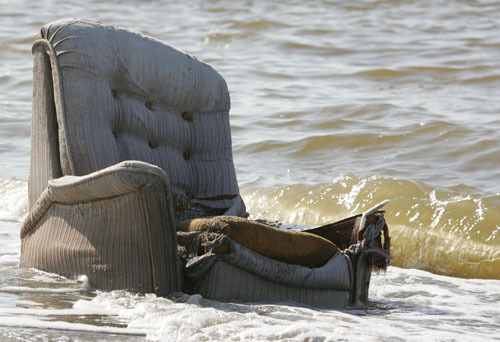 Old boats half submerged, an abandoned chair near the edge of the sea, and many damaged structures created an eerie effect all around us. An abandonded chair with the perfect view. The shoreline of the Salton Sea offers many areas maintained (and some not maintained) where you can view the local wildlife. With 424 species of birds living at the Salton Sea, you will definitely have the opportunity to bird watch at Bombay Beach and the other seaside park areas and wildlife refuges. The birds hunt for fish along the shore and frequently dive into the water. You will see them resting in groups on the pillars of old piers and dilapidated docks. I didn’t have my zoom lens with me on this trip, but you can view photos from my last trip to the area by clicking here. You can click here to view a short video about the Salton Sea. 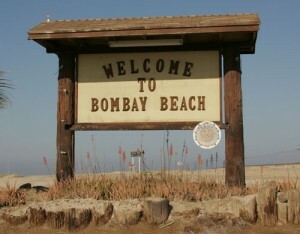 The next stop was Niland, CA, a small town located about 20 miles south of Bombay Beach. The drive into town took us past a few interesting sights along the way. Old abandoned water holes surrounded by ancient fence posts were once used to collect water for crops. These sites provided some interesting photo opportunities. Most of the land was unpopulated along the highway. We crossed the train tracks in several locations and were able to get a few shots of a train passing by. Before we reached Niland, we saw signs for Hot Mineral Spas and decided to take a quick detour to check them out. There were a couple of spas; we chose to visit Bashford’s Hot Mineral Spa to see what the location had to offer. 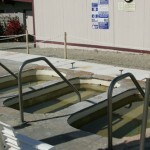 There are six hot mineral baths available at the site. The mineral water flows from 530 feet below the earth’s surface and is cooled and piped directly into the mineral baths. 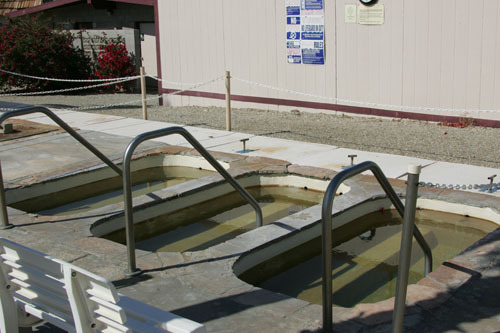 The spa also has an RV campground, a swimming pool, a Jacuzzi, a laundry room, a recreation room with pool table and some nearby horseshoe courts. The people were friendly and it seemed like a great place for winter RV camping. The spa is built at the base of the mountains, providing a scenic backdrop. Shortly after we left the spa, we arrived at the small town of Niland, CA. We stopped for a late breakfast at a small Mexican restaurant. Several local residents were sitting at the table next to us, and we had the opportunity to learn more about life in Niland, CA. Many of the locals commute to the town of Brawley for work, or are employed at the nearby prison. Our new friends noted that quite a few snowbirds were still camping out at Slab City. Asking us if we had come to Niland to visit Leonard Knight’s Salvation Mountain, they observed that his unique work had put Niland, CA on the map. Knight’s life’s work, a mountain he made out of mud that he painted to spread the word of the Lord, draws tourists to Niland from all over the World. Salvation Mountain was indeed our next stop. 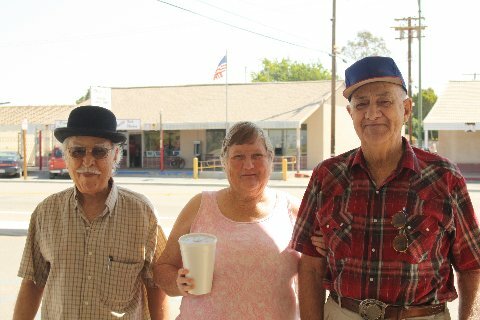 A few of Niland’s local residents who we met at the local Mexican Restaurant. Photo by Sue. As you drive down Main St. in Niland, CA you will pass through a small neighborhood with homes and small businesses. There is a huge, abandoned building that looks out of character in this little town. As we drove by, we wondered what type of business used to occupy the structure. We continued on Main St. and drove towards Salvation Mountain. Main St. becomes Beal Road. 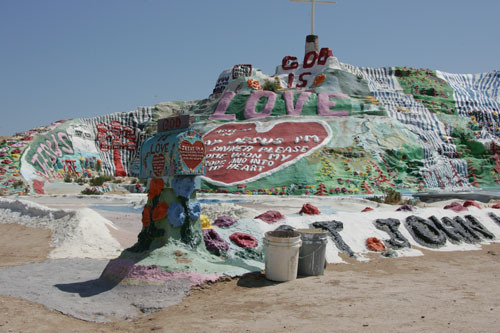 Salvation Mountain and the Slabs are about three miles outside of town. The colorful mountain is hard to miss and can easily be seen from a distance. We drove into Salvation Mountain to be greeted by the infamous Leonard Knight. He was excited to give us a tour and to show us his tractor tire trees, colorful flowers and the lofty blue birds that reside on an old car window used as a sky light. We followed the yellow brick road to the top of the mountain where we could see for miles around. The sun was at the perfect angle to backlight the cross at the pinnacle, for a magical photo looking towards the sky above. Salvation Mountain was a sight to see. It was an experience that we won’t forget anytime soon. 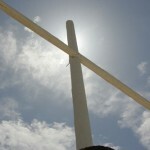 The cross at the top of Salvation Mountain. Leonard said that he had more visitors than normal this winter. He attributed the high traffic to the exposure that he has received from articles and information posted on the Internet. He also had a small cameo appearance in the movie “Into The Wild” which showed the main character in the movie visiting the Slabs and then Leonard at Salvation Mountain. Leonard Knight has achieved his goal of spreading his message, “God is Love.” Each year more and more visitors flock to Salvation Mountain to meet Leonard and to witness his life’s work. He doesn’t charge any fee to visit, but he really appreciates donations of paint and supplies so he can continue to maintain and to build his mountain. 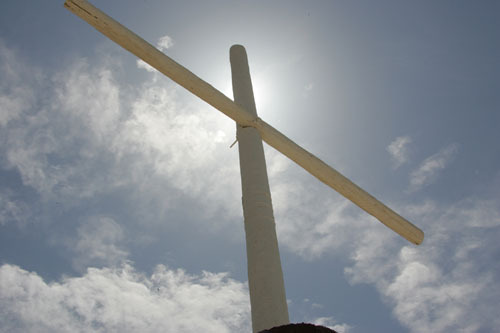 To learn more about Leonard Knight and Salvation Mountain, click here. As you exit Salvation Mountain, turn right and drive through the entrance to Slab City, aka The Slabs. We drove in and stopped by the church to talk to a few of the year-round residents that camp in trailers. They were selling trinkets and various items to generate some extra income. One couple we spoke with was stationed at the Slabs for a year to help run the church. It would be their first summer there so they were preparing for some hot days ahead. They told us where we could find the “Gopher Flats” golf course and directed us to a few other points of interest. There were still quite a few campers at the Slabs, which was interesting to see. During my first visit to the Slabs in May ’09, the place was practically a ghost town. Click here to read more about Slab City and why it is free. A couple of year-round residents of Slab City. They had a rummage sale at their site. Photo by Sue. To view more photos from this trip please click on this link to view the photo gallery. We didn’t get the opportunity to golf at Gopher Flats as our car would not make it through the wash, and we decided to return another day with a few more friends and a Jeep to play a round of golf. If you go, be sure to take plenty of food and water if you plan to spend time at Salvation Mountain and the Slabs. There are no stores, no water, no bathrooms, no electricity and it can get really hot out there. Be sure and stop by to see Leonard. He is always happy to have visitors. For more information about the Salton Sea, Salvation Mountain and Slab City, please visit these pages linked below. I am going to take a trip over there this winter. I think I’ll drive to El Centro, then spend a day or two driving up to Indio. I lived in the Imperial Valley in the 1979’s and did some exploring then. Time to get back out and take a look at it again. We drove to Bombay this late afternoon. Arrived around 630pm and it was cool but freaky! There is a ton of dead fish on the beach and someone arranged dead fish into a symbol that looked satanic. Then there is a wall on one of the abandoned buildings covered in milkbox missing posters. We got totally freaked out and left quickly. Just wanted to let you know that the Cathedral City Historical Society is sponsoring a day trip to the Salton Sea and Salvation Mountain. Your blog is most interesting and informative. If you know anyone that would like to join on this tour Thursday, February 8th *:30 am -2:30 pm please let me know and I can send you a press release and flyers.